Any cake including our Hummingbird Cake and Lime, Ginger and Parsnip Cake as well as any dessert - including our white chocolate trifle free with any main course purchased. 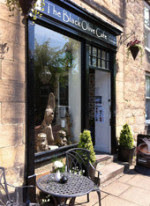 The Black Olive Cafe is situated on the leafy avenue of Bailiffgate, within the CastleQuarter, Alnwick. Just a minutes walk from the historic castle and a few miles from the glorious Northumbrian coastline. The Cafe offers a relaxed, friendly atmosphere with sun drenched (sunny days!) outside seating and comfy sofas, books and daily papers. We are proud of our menu that offers something for everyone including: homemade soups﻿, homemade﻿ deep filled pies, panini, mezzaluna, taskas and homemade quiches. We serve delicious homemade cakes, biscuits and of course fresh sandwiches. We always have an extensive mouth-watering vegetarian range thats a little bit different! We are fast establishing a very good reputation for our coffee and are also very proud to have been rated by our customers, Number 1 in Alnwick on TripAdvisor.